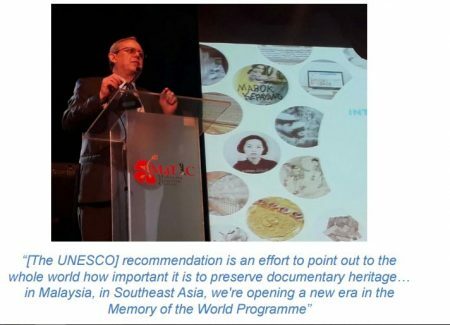 A five-point UNESCO-ASEAN Member States Action Plan emerged from the ASEAN-UNESCO+3 Consultation on the UNESCO Recommendation on Documentary Heritage (09-11 May 2017, Kuala Lumpur). The Action Plan identifies concrete actions that can be taken in the areas of documentary heritage identification, preservation and access, as well as policy measures to support efforts in these areas and opportunities for international cooperation. The Action Plan was adopted by delegates from 10 ASEAN Member States and Timor-Leste. ASEAN Member States, museums, archives and libraries will use the Action Plan to guide the implementation of UNESCO’s Recommendation at the national level. The Action Plan will also help the ASEAN Secretariat, UNESCO, and the Memory of the World Committee for the Asia Pacific develop policies, trainings and projects to address challenges identified by member states. During the consultation, each ASEAN member state, along with Timor-Leste, China and Japan, gave an update on the implementation of the Recommendation in their respective countries, while also sharing opportunities and challenges for the preservation of and access to documentary heritage at the national level. The training materials and presentations given during the symposium can be accessed here (http://bit.ly/2rlw1FA) and the material for the consultation here (http://bit.ly/2rlmJcH). At the 38th Session of the UNESCO General Conference in Paris in 2015, 195 countries voted unanimously in favour of the introduction of a new UNESCO Recommendation on documentary heritage, including in digital form. The Recommendation addresses both the technical and strategic issues that arise in the preservation and use of documentary heritage, providing practical, actionable recommendations that can be used by governments, memory institutes (archives, libraries, and museums), the private sector and individuals. Given that the Recommendation is relatively new, and has yet to be applied in the region, UNESCO is supporting ASEAN+3 Members States and stakeholders in adapting this new instrument to the region’s contexts through this symposium and consultation, the development of the action plan and follow-up efforts going forward. This will be the first global consultation on the implementation of this important Recommendation. The aim is to develop a UNESCO-ASEAN “action plan” for its implementation in the region in line with the recently signed MoU on cooperation between UNESCO-ASEAN.